Chromosomes are made up of a strand of DNA tightly wrapped around proteins called histones. This makes the DNA compact and able to fit inside the cell’s nucleus. A gene is a segment of DNA that encodes for a trait. Therefore, genes are located on chromosomes. 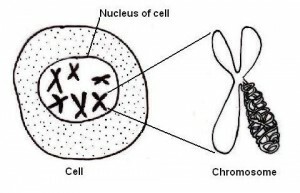 On each chromosome is a constriction point called a centromere, which divides the chromosome into different sections. Human cells normally contain 23 pairs of chromosomes, or 46 chromosomes total. An individual inherits 23 chromosomes from each parent. If there is a change in the number or structure of chromosomes, it can be problematic. For example, some cancers are the result of fragmented chromosomes pieced together. Additionally, Down syndrome, also known as trisomy 21, is the result of having an extra copy of the twenty-first chromosome. Individuals with trisomy 21 have 47 chromosomes. National Human Genome Research Institute. “Chromosomes.” Genome.gov. National Institutes of Health, 8 June 2012. Web. 28 Oct. 2012. <http://www.genome.gov/26524120>. “What Is a Chromosome.” Genetics Home Reference. U.S. National Library of Medicine, 30 Oct. 2012. Web. 1 Nov. 2012. <http://ghr.nlm.nih.gov/handbook/basics/chromosome>.